I also had the time to photograph a couple of tutorials, so look out for those in the coming days. Today, I just want to share a few great tips that I've managed to collect from a number of sources (the amount of time I spend reading about beauty boggles the mind) about how to make the most of your mascara. This will be a quick post, and most of you probably already know these tips, but here they are anyway! Use an eyelash curler. This really opens up your eyes, and - for girls with short lashes - actually makes you look like you have lashes! Take the time to find a good eyelash curler that works best for your eye shape. I recently discovered Koji eyelash curlers, and I am in love with mine! Also remember to clean your eyelash curler! Otherwise, the curls aren't as pretty and you risk disgusting eye infections. Heat is good. Blast your eyelash curler with a hair dryer for a couple of seconds. It adds curl, and helps it last. Only a few seconds, though! It heats up reaaaallyy quickly. Build up a base. When you first start applying your mascara, place your mascara wand at the very base of your lashes, then 'vibrate' the wand there for about 5-10 seconds. Coat the entire base of your lash line like that. Zig-zag. Apparently, this is a controversial technique (it's funny how blown up arguments about mascara can get when there are so many more important things in the world to think about). Some say it works, some say never ever to use it. Personally, I find it helps catch all my puny lashes, so I like it. Start on the base you've already built up and zig-zag outwards. Use the tip of your wand. The tip of your wand coats the ends of your lashes really well, and lengthens them, too. I love layering at the outer corners, because then I get a nice doe-eyed look (very subtle, but it's there!). Powder your lashes first. I read that this is Jessica Alba's makeup artist's favourite technique to add volume to your lashes. Dust a loose powder over your lashes after curling them, and before you apply your mascara. If you have the time, try both brown and black mascaras. Brown is said to add volume, and black, length. 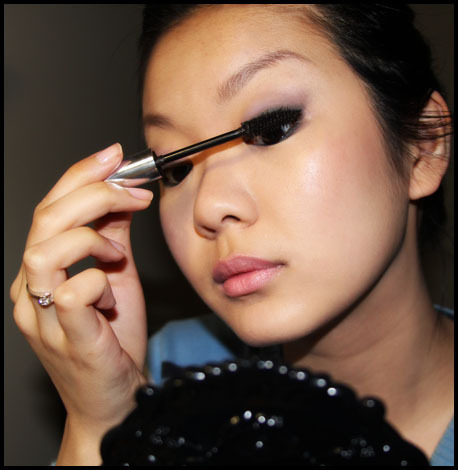 Apply a brown (preferably volumnizing) mascara first, then apply black to only the tips of your lashes. Throw out old mascara. Mascara is only meant to last you 6 months. Throw out anything older than that, because chances are, the mascara will be dry and flaky, and full of bacteria. Buy cheap mascara. This tip is just something I personally like to practise, and isn't for everyone. In my opinion, you're going to have to throw it out in 6 months anyway. It's not worth buying crazy expensive mascara when some less expensive ones perform just as well. Some really good affordable brands I've tried include Max Factor, Australis, and Majolica Majorca.